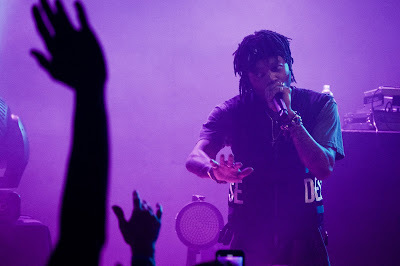 By the time Atlanta rapper J.I.D walked onto the Granada stage last Sunday, five other acts had already performed. Most crowds would've been wiped out at this point, however, this hungry pack of Dreamville diehards gave the night's headliner just as much energy as the formidable openers that proceeded him. J.I.D, the 27-year-old born Destin Route, performed a large portion of his 2017 debut "The Never Story." The record oozes with dense, lyrical storytelling and drips tasteful, nineties and oughts nostalgia -- "EdEddNEddy" combined these elements superbly. Route's nasal rasp also registered surprisingly smoothly in the mix and his stage presence created an organic energy within his audience, no prodding-along necessary. EarthGang -- a duo making a name for itself with soul-infused, Southern stoner rap not unlike OutKast's -- joined J.I.D as a co-headliner and brought a party energy that fueled several exciting moments early in the set, but slowly began to wear down the crowd as things moved along. D.C. rapper Chaz French performed a set that showcased his expertise in crowd control, orchestrating mosh pits, crowd surfing, and other antics for much of his half-hour set. North Carolina emcee Lute was the first touring support to play, offering endearingly aggressive raps over chilled-out beats that any alternative hip-hop fan could vibe to. Local support came from Aaron Alexander and A'Sean. Alexander is no longer a stranger to the Granada stage; he knows this. His half-hour set was executed perfectly, offering up three enticing new songs and a sampler of "Memento Mori" cuts. Anyone who saw him perform his timid early performances three years ago knows how big this set was. Alexander wore his heart on his sleeve and defiantly cackled in the face of some haters he noted were in the crowd. By the end, new fans were throwing up their hands and swaying along to "54U" like it was an old favorite. Sunday night's opening slot was A'Sean's largest concert audience he'd ever performed for. He quickly showed his versatility by performing mic-stand R&B cut "Open" back-to-back with high-energy tracks like "Black Men Don't Cheat" and "Facts." His sincere, but playful banter all but guaranteed that this wouldn't be his last set on this stage.